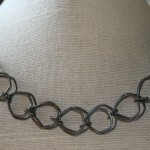 Duncan Designs is juried in jewelry & fiber. 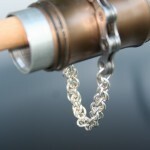 Our sterling silver jewelry highlights hand-made chain. 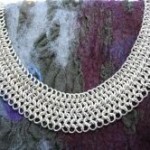 The ancient arts of making chain maille or combing wool and fabric into felt capture my artistic spirits. 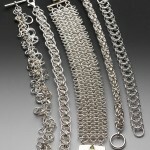 I am a juried member in both jewelry and fiber. 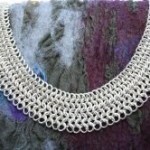 Making sterling silver chain is like knitting with wire. With pliers in each hand and jump rings cut from coiled wire, a jeweler creates intricate patterns of chain from which to weave endless varieties of jewelry. My fascination with history inspires a quest for ancient beads, 2000-year-old Roman glass artifacts, and even 400-year-old “Dutch donuts” – blue glass beads from the Dogan tribe in Mali. These merge with artistic chain to create bracelets, necklaces, and earrings; each as unique as the ancient history that left these artifacts. 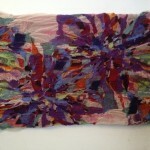 I “paint” with wool fibers and felt it onto silk to create nuno-felted scarves, wraps, and wall art. The fabric is made by arranging the wool roving on the silk; hand-rolling the wet, soapy wool and silk 600 times; fulling – repeatedly dropping the fabric – to work the wool through the silk; and finally hardening the felt by hand. The result is a one-of-a-kind piece of textile to wear for any occasion or to make part of your room’s decor.